My starting point for this recipe was Joy the Baker's Hot Buttered Rum and Cider, I changed up the spices for things that can be easily fished out. Then you can get the stick blender in there to emulsify the butter so that it's perfectly smooth and not at all separated. Pour cider and water into a small saucepan and add cinnamon sticks, bay leaves, the cutie stuck with cloves, a pinch of nutmeg, and a pinch of salt. Bring to a boil over medium heat, remove from heat, and cover and steep for fifteen minutes. Uncover, fish out the cinnamon, bay, and cutie, and add the butter and rum. Blend with a stick blender. 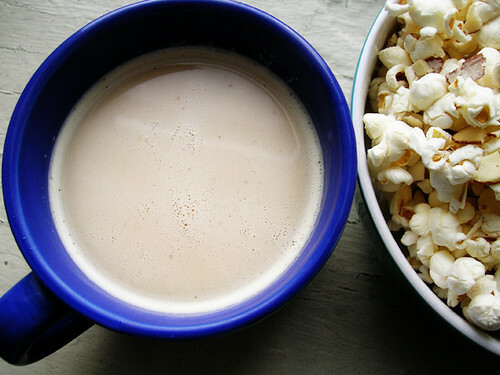 Ladle the buttered rum into two mugs, and make a big bowl of popcorn. Idk if I mentioned, sometimes I throw a handful of sliced almonds on my popcorn? Sometimes I throw a handful of sliced almonds on my popcorn.